The ten cent coin was first introduced with decimal currency on 14 February 1966. The original reverse design of the lyrebird on standard circulating coins has not been changed since the introduction. The obverse design was altered in 2016 to mark the 50th anniversary of decimal currency, but the reverse design of the lyrebird has remained constant. All of the first issue of ten cent coins in 1966 were produced at the Royal Mint, London. 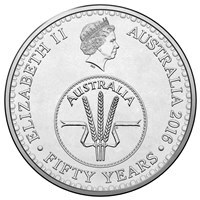 Since the first production from London, ten cent coins have been produced by the Royal Australian Mint and the Royal Mint, Llantrisant.